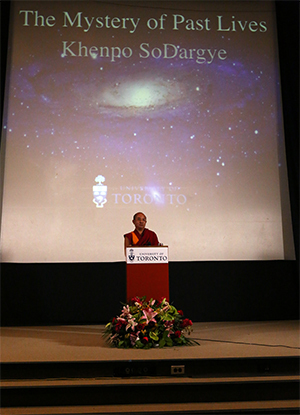 In this talk, Khenpo Sodargye Rinpoche discusses the Buddhist philosophy of life, sharing with us Buddhist and scientific views to prove the existence of past lives and the afterlife. There is evidence of the mind not being produced by the body or substances, and that it can exist independently and continuously. So the possibility of the existence of past and future lives is worth considering, and one should not deny it blindly without careful contemplation. If Afterlife Really Exists, What Shall We Do? About past lives and the afterlife, is it really so inconceivable, unbelievable and abstruse? In fact, it is not that difficult to understand. Actually everyone here can get a very precise answer after researching for a period of time with devotion and diligence. Excerpt 2. If Afterlife Really Exists, What Shall We Do? Whether contemporary or future human beings, no one could escape death. What should we do after death? If the afterlife really exists, isn’t it necessary for us to think about our death and make some preparations for it? If afterlife really doesn’t exist and nothing exists after death, our current way of life is OK. However, contemplation on the afterlife will never be in vain. If the afterlife does exist, it’s good to consider about this issue beforehand, and do preparations for death in advance. Even if you found it not to exist, such a contemplation on death would at least help you to discipline yourself and behave according to the morality and ethics. In such a way, even if the afterlife did not exist, it would never have any negative effect or bring any unhappiness in your life in the future. In Buddhism, there’s a way of making a deduction about the existence of previous and future lives. The mind, whose nature is a clear awareness, can only be born from its own continuum—mind or awareness, which is its root cause of existence as believed in Buddhism. The mind can never be produced by the body or other substances, which only act as an assistant condition for the existence of the mind. For example, the seed of a plant is the internal cause. While sunlight and moisture are external factors, which only have auxiliary effects to the growth of this plant. In short, there’s no doubt that beings will continuously reincarnate until obtaining liberation from samsara. I hope many scholars, teachers and students could explore the mystery of the mind with all their wisdom. This is very necessary for us. Every one of us shares the same goal. We all pursue happiness, and try to avoid suffering. 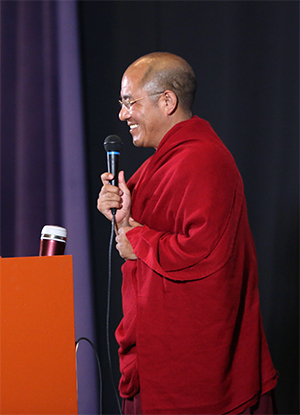 From the Buddhist perspective, happiness results from virtuous deeds. Doing good deeds will bring about happiness while doing evil deeds will bring about suffering, this is a fundamental value for us as human beings. If everyone establishes noble values and right views of life such as this, I believe our world will be better and more beautiful. Every one of us shares the same goal. We all pursue happiness, and try to avoid suffering. From the Buddhist perspective, happiness results from virtuous deeds. Doing good deeds will bring about happiness while doing evil deeds will bring about suffering, this is a fundamental value for us as human beings.